So when I was younger one of me and my cousins favourite movies was The Land Before Time". If you've not seen it basically the food has all but disappeared so the dinosaurs need to migrate elsewhere (I think it's called Green Valley). The movie focuses on Little Foot who unfortunately suffers a lot of heartache at the start of the movie (my cousin used to cry his eyes out) as he is setting off but along the way makes lots of new friends. (I don't wanna give too much away as I think you should go watch it). When I saw this polish on LynBDesigns Etsy page I knew I had to have it. 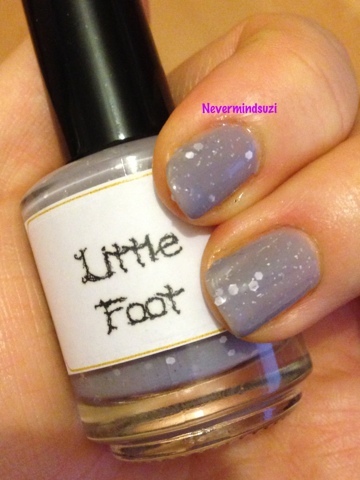 A muted purple with silver glitters and silver hexes through it. Such a beautiful understated colour.